The Soay Sheep Project runs three main trips a year to the St Kilda archipelago and one of the jobs is to census the whole study area within the skyline of Village Bay, Hirta, recording the tags and positions of all the sheep on 10 occasions each trip. This means we are looking intensively for animals hiding from us and hence we tend to see everything else that moves or stands out as unusual. So, on 29 March 2018, while crossing back over the area and passing above the fire pond at the west end of the bay, I was quick to pick up an unusual bird on the surface, repeatedly diving. 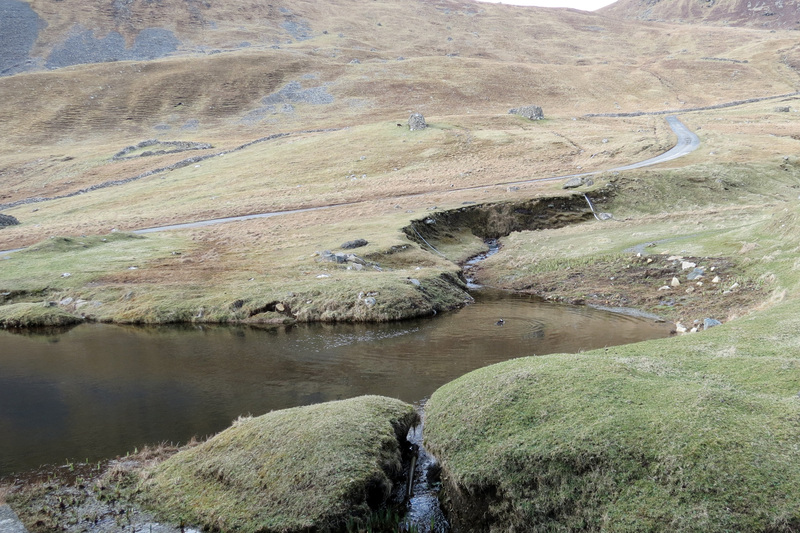 Jill's sheep census on 29 March 2018 revealed an exotic-looking surprise on one of St Kilda's two ponds (Jill Pilkington). Turning the telescope towards the pond, the bird raised its crest and gave a wonderful view of the impressive white feathering on its head. I looked it up in our bird books back at the Factor's House and, once I decided it must be quite a special find, went back to photograph it. Being an extremely amateur birder, I always pass anything exciting or that I need confirming to Will Miles, who did his PhD out here and is always very helpful. He confirmed the identification of the dead Allen's Gallinule I found here last year and I know he enjoys my more unusual finds! Will was able to confirm the bird as a drake Hooded Merganser. It is still here at the time of writing [5 April], each day becoming more settled. On the first day he took off and did small circuits fairly frequently, but seemed far more interested in feeding. One photo I have shows what I think is a European Eel elver in his beak; we know they are resident in the pond and the colour is right for an elver. He also kept going close to the bank overhang, hunkering down as if he seemed to perceive a threat. Now he seems much more settled, spending time preening and sleeping with his head tucked under his wing when not feeding or doing the odd circuit. Some days he is now not on the pond for long periods, but then appears again and settles down. The bird was observed actively feeding on what appear to be elvers (Jill Pilkington). By 5 April, when this image was taken, the Hooded Merganser had become somewhat more settled, often sleeping for long periods (Jill Pilkington). No leg rings have been seen and, while there was a suggestion that it was the drake from Dorset, which has recently disappeared, a photo of his left leg confirms that it definitely does not have a ring on it, as the Dorset bird has. He has been watched carefully with a telescope by several members of the Project and we am sure there is no ring on his right leg either – I am hoping to capture this on film if he stays a little longer. This extraordinary image, taken on 29 March, shows the Hooded Merganser on the fire pond, which in itself is tiny, being no more than 20 metres in length (Jill Pilkington).